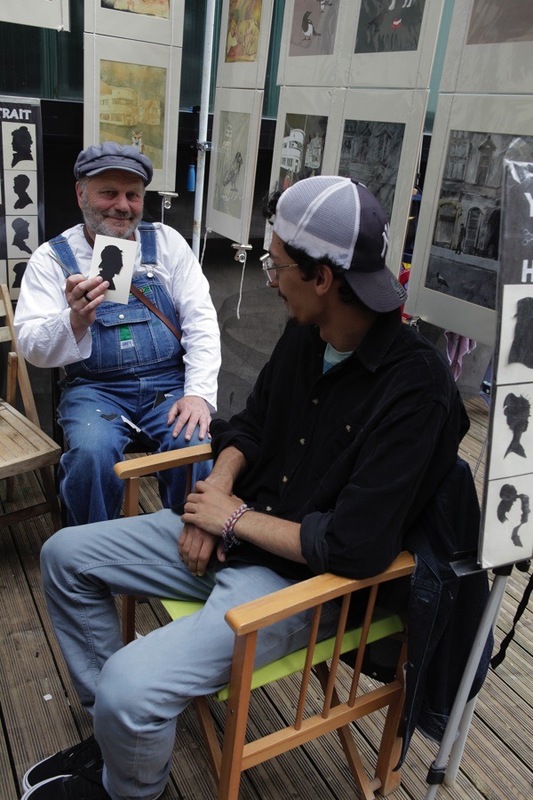 With his weathered features, grizzled beard, sea captain’s cap and denim bib overalls, Silhouette Artist Matyas Selmeczi looks like he has just stepped off a boat and out of another century. 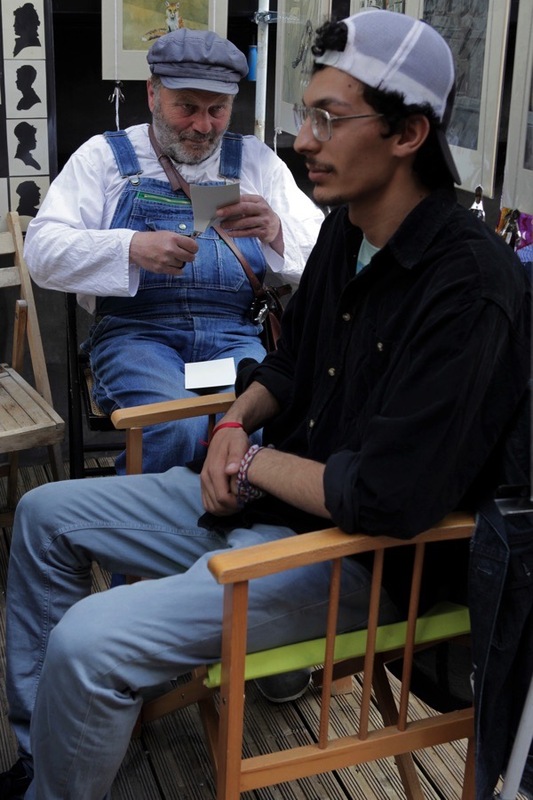 For several years now, Matyas has been a fixture in Spitalfields and he is participating in the Huguenot Skills event next Saturday 20th where there will be the opportunity for you to have your silhouette done. Such is his gentle, unassuming personality that it is possible you may not have noticed Matyas sitting in his booth, yet I urge you to seek him out because this man is possessed of a talent that verges on the magical. With intense concentration, he can slice through a piece of paper with a pair of scissors to produce a lifelike portrait in silhouette in less than three minutes, and he does this all day. Once his subject sits in front of him looking straight ahead, Matyas takes a single considered glance at the profile and then begins to cut a line through the paper, looking up just a couple of times without pausing in his work, until – hey presto! – a likeness is produced. The medium is seemingly so simple and the effect so evocative. Silhouettes were invented in France in the eighteenth century and named after Etienne de Silhouette, a finance minister who was a notorious cheapskate. 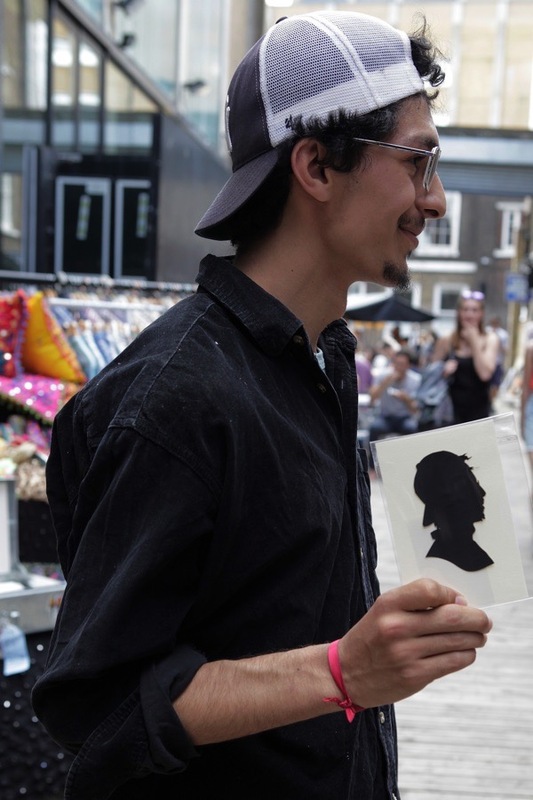 These inexpensive portraits became commonplace across Europe until they were surpassed by the age of photography and when you meet Matyas, you know that he is the latest in a long line of silhouette artists on the streets of London through the centuries. In spite of photography, silhouettes retain their currency today as vehicles to capture and convey human personality in ways that are distinctive in their own right. And for less than a tenner, getting your silhouette done is both a souvenir to cherish and an unforgettable piece of theatre. “I have always been able to draw and I trained as an architect in St Petersburg. When my daughter was eight years old, I tried to teach her to draw but it was too early and she would cry. A pair of scissors were on the table so I picked them up and cut her silhouette to make her smile – that was my very first. When she was twelve, I was able to teach my daughter to draw and now she has become an architect. In 2009, I was working in Budapest as an architect, but there was a crash in Hungary so I came to London. I found there was also a crash here, so I couldn’t get a job and I decided to do silhouettes instead. The first two years were hard but interesting. I did not know anything, I started in Trafalgar Sq. A friendly policeman explained that I could not charge, instead I had to ask for donations. 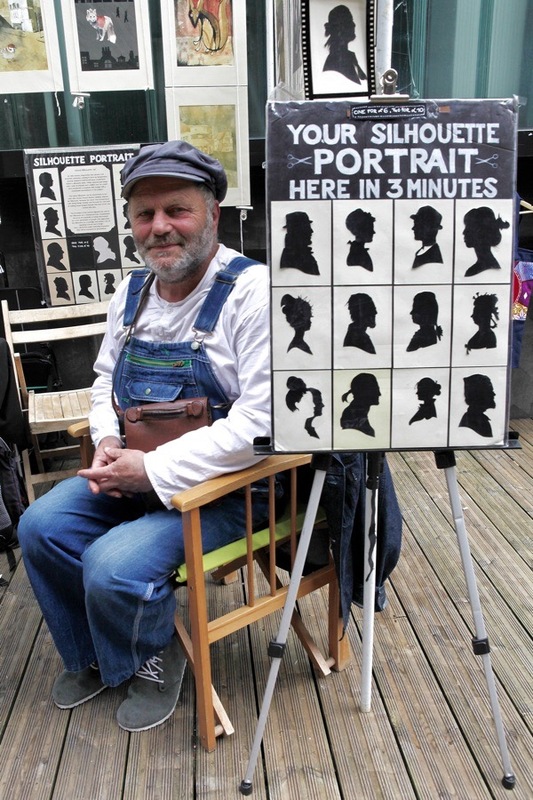 Then I was on the South Bank for two years and I used to have a line of people waiting to have their silhouettes done. In winter it was very hard, I had gloves and put my hands in my pockets to keep them warm so I was ready to work, but it was very windy and the wind blew away my easel and folding chair. So four years ago, I came to Brick Lane where I can charge money but I have to pay rent, and I’ve been here every weekend since, and I am in Camden from Wednesday to Friday. On Monday and Tuesday, I am free to do my own drawing and painting. To draw a portrait you start from the brow and draw the profile but with a silhouette you begin with the neck. It is like a drawing but you only make one line and you cannot make any mistake in the middle. It is like a shadow or a ghost. It takes me three minutes but it is not hard for me. I like to do father and son, mother and daughter and it is very interesting to see the similarities and the differences, and how the profile changes over time. Anybody can take photographs but silhouettes require skill. It is not really an art but a beautiful craft. You must have good eyes and very good hands. 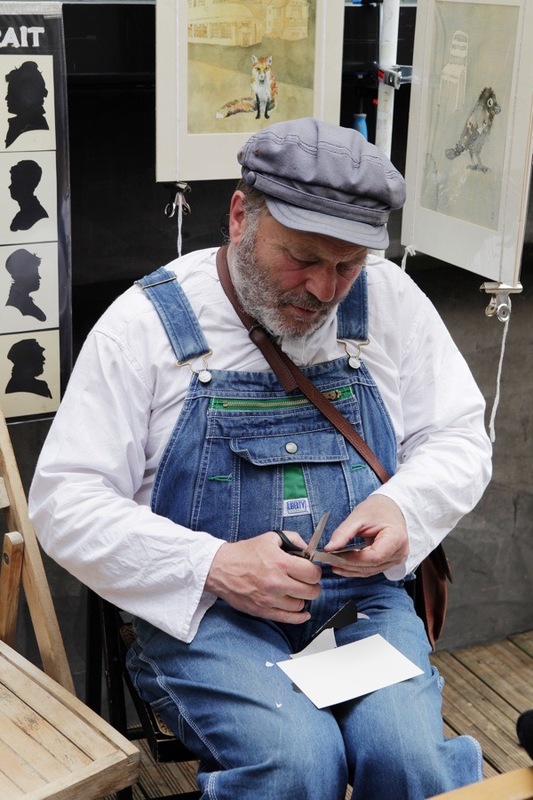 The first time I saw a silhouette being cut was in Milos Forman’s ‘Ragtime.’ In the first few minutes of the film, you are in the Jewish quarter of New York and you see a silhouette artist on the street. She had come to this country as a child with her family from Vienna in the thirties escaping Hitler and cut silhouettes on the streets of London. Her name was Inge Ravilson and she was eighty-eight years old. She invited me to her home, and I visited her and we drank tea. 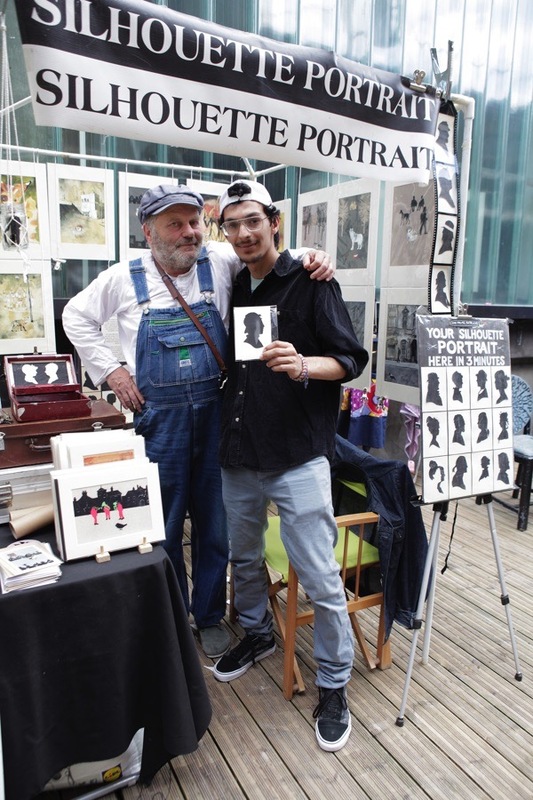 Matyas Selmeczi can be found in Spitalfields every weekend and is also available for parties, weddings and events. What a talent! So wonderful to see a visual artistry with such a venerable history rejuvenated in the present. I am absolutely thrilled by your blog (and I am not even a Londoner). This blog is the best of its kind!